Cherry blossom suits meeting and parting well. You would ask why. You can get it by knowing ordinary school calendar in Japan. In most countries entrance ceremonies are held in September but in Japan at the beginning of April, the season of cherry trees in full bloom. You can also see graduation ceremonies in late March when cherry comes into blossom. If you have Japanese friends, ask them to see the photos of their entrance ceremonies. Like the Image 1, most of them show the symbolic blossoms of Japan. For children at the age of six, their elementary school life begins. The period of compulsory education is nine years in total including junior high school of three-year. Though, over 90 percent of students move up to senior high school of three-year. It means the entrance ceremony of elementary school is the starting point for most children following twelve years’ school life. In April, children in a new school uniform carry a school bag on their back and attend an entrance ceremony. The bag which is to be used for the following six years is closely selected by a child, parents, and often grandparents considering the size and color. This shopping of the bag is also their pleasure. Some children continue to use this school bag near mint-condition for six years, on the other hand others make it shabby-looking when graduation comes. How about me? I was the latter, of course. Fashionable school uniforms attract many student though some schools permit ordinary clothes. It is because some urban private schools offer well-cut and stylish blazar uniforms, which can be the advantage to recruit new students. You would associate commuting to school with a school bus, but in Japan it is a relatively rare case. Common way to their school is to walk in a group in which children in local community get together. At lunch time, Japanese elementary schools adopt the school catering system and children have lunch in a classroom. Usually, a large-scaled cookhouse named “School Lunch Center” provides lunches for thousands of students and carries them by track to each school. Students set the table in rotation. When I was a school boy, only growth of children were taken into consideration by nutritionists in most of the menus. In addition to nutritional balance, nowadays dessert or seasonal delicacy, for example Christmas cakes, is served. After class, children start to clean their classrooms, corridors, and so on. In countries other than Japan, the jobs are generally outsourced to private cleaning companies. In Japan, however, cleaning is considered to be part of education. Few people notice that this custom has been influenced by Zen Buddhism. At a Zen temple, priests spend much of their time in Zen sitting meditation and doing cleaning as part of their religious training. Come to think of it, the characteristics of Japanese education emphasize the adaptation into group and a spirit of self-sufficiency at the same time. On reflection, I was often scolded by teachers for blowing off cleaning. Suspending cards from neck are necessary to submit for their certification of attendance. Annual school life consists of three terms – the first starts from the beginning of April to around 20th July, second from 1st September to around 20th December, and the third from around the 10th January to around 20th March though exact date varies by region. Children get three big vacations in a year. The summer vacation is one of the freest and longest and provides opportunities that children usually never have experiences in ordinary school life. Swimming in the sea or playing in a river or stream is a typical scene in summer. Since there are many cicadas in Japan, insect collecting with a net and cage is a summer feature and the most popular insects for them are beetles. Even beetle sumo competitions are held in each place. However, summer vacations don’t mean children can always afford to have fun all days. At 6:30 a.m. they take part in a bodily exercise to the radio music and have a seal put on the card. What is more, a lot of homework is given out and it is required to be worked on in a planned way. An interesting assignment of those is a summer vacation research project. Children pick a theme of choice and put it together on a large paper which is to be exhibited in classrooms or corridors after vacation. I remember my theme was the difference in the temperature between the town I lived in and a remote village my cousin did. And the date was graphed. By the way, maximum daytime temperature was about 30 degree C, but now it is not rare to rise to 35 degree C. Global warming is true, isn’t it? I dug in my homework, but some people rush to finish it at the end of the vacation with their family. A team which takes opponents’ cap is a winner. Summers in Japan are very sweltering. Unlike Europe, autumn is the season for sports. The Tokyo Olympics in 1964 was also held on 10th October. Under a bright blue sky and splendid fall weather, athletic festivals are held as the biggest autumn event. Whole school students are divided into two groups, a red team and white team which play team sports like a tug of war or ball toss. In addition, interclass relay race matches, individual sprint races, and mock cavalry battles are popular. Students are not alone in working hard on the day. So do parents. A schoolyard is encompassed with shady canopies. Parents compete to hold a good place as much as possible from early morning. Many of the parent record their children participating any events from a camcorder. Without athletic festivals, consumer electronics companies would suffer a little bit of damage to their sales. Let’s take a tour of Japanese School Facility! Students from other countries are first surprised to see these big shoe lockers. In Japan, people take off their shoes on entering their homes. Schools also adopt this custom. Arriving at school, children put their shoes into place and change into indoor shoes. I have an interesting story. Some, at puberty usually junior high school students, find out a love letter in their shoe. Me? I’ll leave it to your imagination. There are gymnasiums in almost every school. 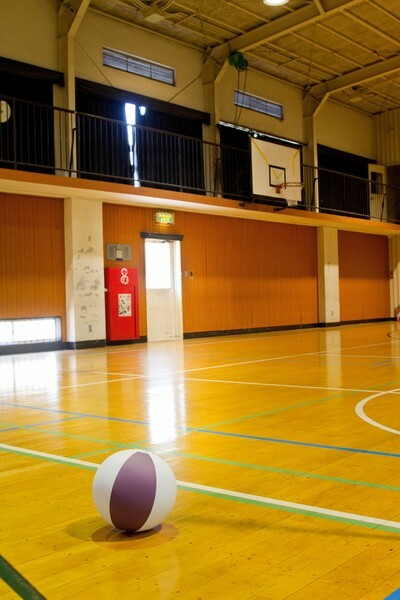 Children can play volleyball, basketball and any indoor sports. This building is used on an occasion such as entrance and graduation ceremonies. There is a stage behind the forward curtains (Image 17) where a principal makes a speech or students sing a song at an interclass chorus contest. When I was a junior high school boy, I have acted as a conductor. Even now I remember strong strain made my feet tremble. I don’t think I could manage to serve as the role. By the way, swimming is made compulsory in Japan. For this purpose, a swimming pool is built at each school. In 1955 a big ship collision happened and the death toll hit over 100 school children during the school trip. And then swimming pools in school became widely popular in spite of the high-cost facilities because the casualties must have decreased if everyone could have swum. In the now it is difficult to find out a school without a swimming pool. After New Year holidays, the third term begins at school and actually lasts about two months. Teachers and students prepare graduation ceremony and spend busy days. They feel time has gone very quickly in this season. Junior high school students in the third grade in particular have to take entrance examinations to high school and cannot afford to spare any school events. Late March comes when cherry blossoms start to bloom. Some move to the next grade and others graduate from school. Nearly 150 years has passed since the modern education system was established. Cherry blossoms have always flavored the scenes of the beginning and ending in Japanese school life. Recently autumn admissions have been considered for the convenience of increasing international students. What will be Japanese school like in the future? This song is sung in chorus on graduation ceremonies.